Guys. Wanna see some guts? I knew you would. You’re gross. 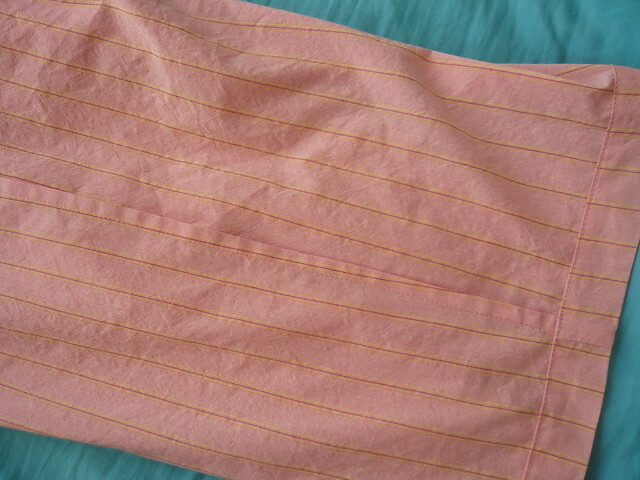 Look, a beautiful French seam! See how neat and tidy? A little tab to differentiate front from back (in a matching pink, to boot)! But wait– what’s that goodness there? What, this old thing? Oh, it’s nothing… only a NEATLY OVERLOCKED CROTCH SEAM. That’s right. I HAVE A SERGER NOW. OK. Take a deep breath. BWAAAAAHHHHHH I HAVE A SERGER!!!!!!!!!!!!!!!!!!!!!!!!! Can you tell that I’m REALLY excited about this? It’s the Brother 1034D, and it’s quite the reasonable fellow (with shockingly good reviews on Amazon!). I’ve been eyeballing it for quite some time, and after Gail bought the same model and loved it, I decided I HAD to have it. HAD to. I opened up the box, got really scared by all the parts and the manual. The DVDs provided with the machine wouldn’t really play correctly on my Mac, but I found this easy tutorial from Artist Kae on Youtube, and I was serging in about 10 minutes! Thanks for sharing the video, gal! I may have been jumping up and down and shouting like a lunatic after I serged the crotch seam. It’s just so… perfect? Clean? Elegant? FANCY? I’m in love! What are you guys up to? Cookin’ up any big projects? I don’t know about you guys, but I can’t wait to see photos of Maddie’s dress! And I’m still making my way through your PJ posts– so, so cute! I can’t believe how fun that was! « Ginger Made: Pajama* Party, or, the Pink Nightmare Pajamas! Yay, I hope you’re able to get one soon-ish! This one really was very reasonable– I had sticker shock when I first started looking at sergers! That’s great! I love my serger as well. big huge YAYYYYYYY! I’m so happy for you! You are going to love having this baby! Weird though – I’m on a Mac too, and the DVDs played fine for me. Go figure! Thanks for inspiring me! I’m so excited to use this thing! Do it, girl! This one really wasn’t very many pennies– my Lenten fabric-buying ban saved just about enough cash to swing it! How exciting. A proper grown up sewer now! Jealous!!! I have a Brother sewing machine and love it. 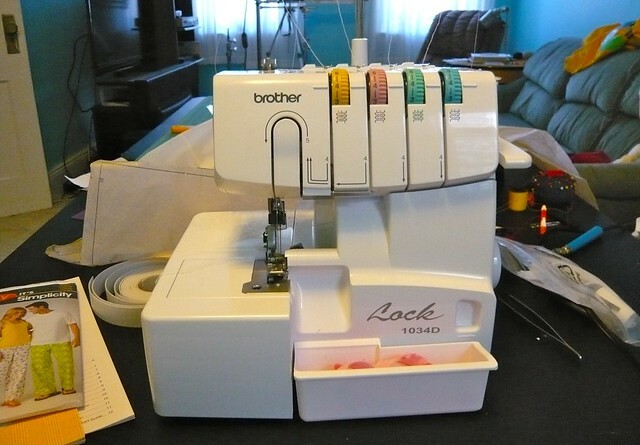 If I get a serger I would like to get a Brother one as well. You will have to let me know what you think of it as you do more work with it. I definitely will! So far I’m in love! Hooray! My neighbor has that exact same serger and uses it for everything. She loves it! In fact, her raving about her serger is what put the idea of a serger in my head. I see a lot of lovely seams in your future! 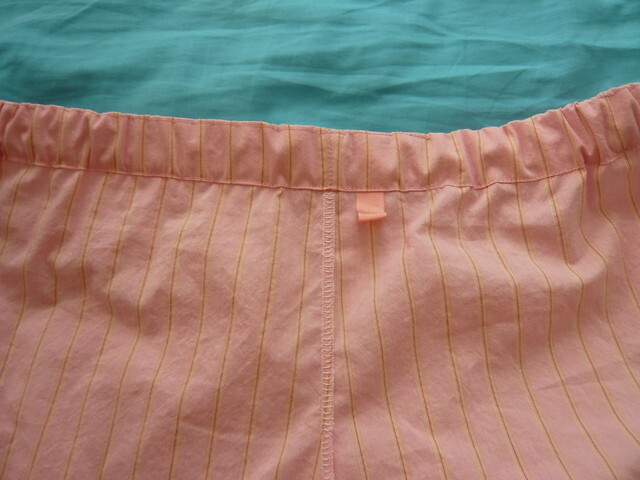 Hooray for clean seams!! Yay!! It’s so clever! I wish my regular sewing machine had a catch-all. And if there was a way to get one for, oh, my entire apartment, that would be AWESOME. Some sort of a bin that all my accumulated junk could just be whisked away into? Amazing! That would be PERFECT! I’d settle for a Mary Poppins-like nanny/housekeeper (for me… no kids to blame the mess on!). They come without the little bins? That’s insane. Rig something up, quick snap! you know what i love about us sewing folk?! we get so excited about things like this… (And rightly so I might add – YAY for your new little brother!!!) but have you ever tried to explain to someone who doesn’t sew why you have 2 machines and show them some serging/overlocking on whatever item of clothing is handy and they’ve never even noticed that there’s different types of stitching going on in there!!! You are too too nice! I so can’t wait to show you my dress too! We had a photoshoot last Friday in Florida and I’m sure you saw some of the pictures on my Facebook page. We shot for twelve hours and I can honestly say that it was more fun than the wedding itself. The set where I’m wearing my dress involves a dog! That’s right, a dog! I wish I was in Philadelphia when you were. Next time you’re here, definitely let me know and we can meet up! Ahhh we have the same serger/ overlocker! I just got my new man as well… his name is Locklan (deliberate misspelling… getit?). Doesn’t it make life just so much easier? And love your French seam too, beautiful. It’s the BEST THING EVER! I feel like a complete pro! I have the same model as well (and his name is brother sergio) i absolutely love it! Congrats on your new toy, there’s no turning back now! Yay! I’m so glad to be in this club! I could look at those guts all day. All day. Show me some more. Actually, tell me some more. Get fancy with the serged rolled hem feature on that sucker, and tell me how it performs. 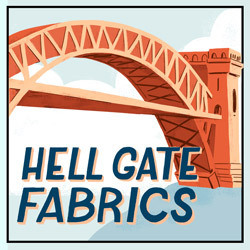 On the airiest fabric you can get your dirty hands on. Because I’m in the market, and though I long for a BabyLock, it’s just out of reach at the mo’. Who am I kidding… probably always. I’ll give it a try– this machine is scary, dude! ROLLED HEMS? Yowzer! Those BabyLocks sound amazing (but what in the F is “Jet-Air Threading”?!?!)! Right! For a $1000 discount, I can thread my own serger. You’ll own that machine in a few days 🙂 My mom made me learn to thread hers before I could lay my hands on it, and I had zero patience as a wee one. Congratulations! What a wonderful new tool! Thanks for the video link. That is helpful to me, as I own this machine. So now I’m motivated to take it out of the box and get going already! The video is so easy to follow– I bet you’ll find it helpful. I just paused it after every step to make sure I was doing it right. Now that’s the best sort of Little Brother and not the type that leaves frogs in your bed and steals your chocolate…wishing you every happiness with your new family member ! Yippee! I love this family! I can’t wait to see what all this guy can do!! This is the same serger I want! It’s been in my amazon cart ever since Suzie from Su Sews So-So got one. I AM SO JEALOUS! Wow, this serger is a popular little guy! I’ll be sure to tell you how I like it– hopefully you can get one SOON! Congrats!! That is so exciting! And way to jump right in – It took me a really long time to not be scared of my serger. I’d even take my entry-level Singer into a local sewing shop to get threaded and to have them adjust the tension. Now I can’t believe I did that. The insides of your jammies look beautiful! That tab is a great idea. Thanks, lady! 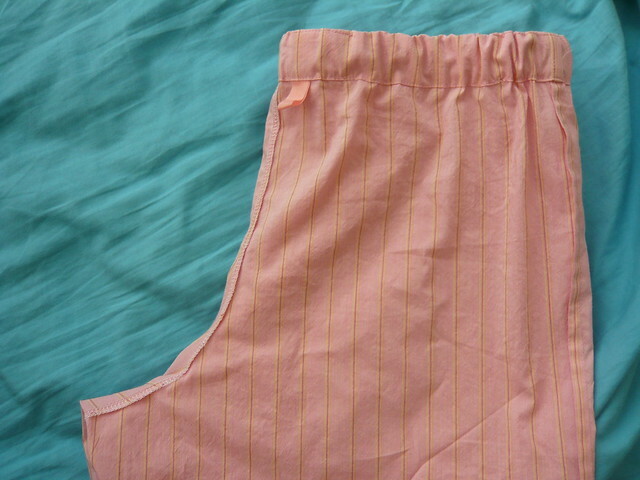 If I had waited a little, I would have seen that Karen makes a longer tab thingy for her PJ’s so she can use it as a hanging loop– she’s so smart! OH THE ENVY!!!! Seriously gorgeous seams there – and seriously jealous of your awesomeness over here. Congrats on conquering the serger! Thanks, Meg! I’m so excited!